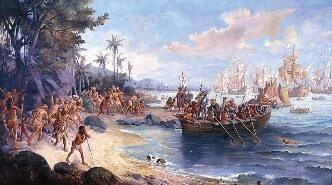 Prior to the arrival of Europeans, Brazil was settled by thousands of small tribes. These tribes did not develop writing or monumental architecture and little is known about them before 1500 CE. 1500 - Portuguese explorer Pedro Alvarez Cabral discovers Brazil while on route to India. He claims the land for Portugal. 1532 - Sao Vicente is established as the first permanent settlement in Brazil by Portuguese explorer Martim Afonso de Sousa. 1542 - Spanish explorer Francisco de Orellana completes the first navigation of the entire Amazon River. 1549 - Jesuit priests arrive and begin to convert the locals to Christianity. 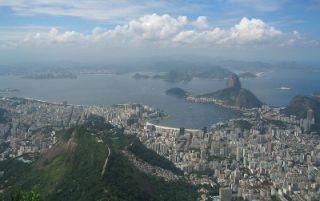 1565 - The city of Rio de Janeiro is established. 1630 - The Dutch establish a colony called New Holland on the northwest coast of Brazil. 1640 - Portugal declares its independence from Spain. 1661 - Portugal officially takes over the territory of New Holland from the Dutch. 1727 - The first coffee bush is planted in Brazil by Francisco de Melo Palheta. Brazil eventually becomes the world's largest producer of coffee. 1763 - The capital city is moved from Salvador to Rio de Janiero. 1789 - A Brazilian independence movement is stopped by Portugal. 1800s - Millions of slaves are imported to work the coffee plantations. 1807 - The French Empire, led by Napoleon, invades Portugal. King John VI of Portugal flees to Brazil. 1815 - Brazil is elevated to a Kingdom by King John VI. 1821 - Brazil annexes Uruguay and it becomes a province of Brazil. 1822 - Pedro I, son of John VI, declares Brazil an independent country. He names himself the first emperor of Brazil. 1824 - The first constitution of Brazil is adopted. The country is recognized by the United States. 1864 - The war of the Triple Alliance begins. Brazil, Uruguay, and Argentina defeat Paraguay. 1888 - Slavery is abolished by the Golden Law. Around 4 million slaves are set free. 1889 - The monarchy is overthrown by a military coup led by Deodoro da Fonseca. A federal republic is established. 1891 - The First Republican Constitution is adopted. 1917 - Brazil joins World War I on the side of the Allies. 1930 - Getulio Vargas takes power after the Revolution of 1930. 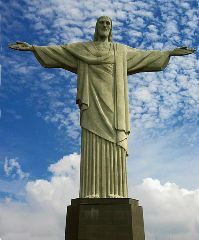 1931 - Construction is finished on the Christ the Redeemer statue in Rio de Janeiro. 1937 - A new state is established and Vargas becomes dictator. 1945 - Vargas is ousted by the military. 1951 - Vargas is elected president again. 1954 - The military demands Vargas' resignation. He commits suicide. 1960 - The capital city is moved to Brazilia. 1964 - The military takes control of the government. 1977 - Pele retires from soccer as the all-time league goal scorer and winner of three World Cups. 1985 - The military gives up governmental power and democracy is restored. 1988 - A new constitution is adopted. The powers of the president are reduced. 1989 - Fernando Collor de Mello becomes the first president elected by the people since 1960. 1992 - The Earth Summit of the United Nations is held in Rio de Janeiro. 1994 - The real is introduced as the official currency of Brazil. 2000 - Brazil's 500th anniversary is held. 2002 - Lula da Silva is elected president. He is a very popular president and leader among the working class of the country. 2011 - Dilma Rousseff becomes president. She is the first woman president of Brazil. Until the arrival of the Europeans, Brazil was settled by stone-age tribes. Then the Portuguese arrived in 1500 and Pedro Alvares Cabral claimed Brazil as a colony of Portugal. The first settlement was founded in 1532 and Portugal began to take more of the land. The primary export was sugar. Slaves were imported from Africa to work the fields. Brazil continued to expand through wars and battles. The Portuguese defeated the French to take Rio de Janeiro and also took over several Dutch and British outposts. 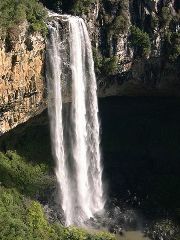 Soon Brazil was one of the largest territories in the world. Today it is the 5th largest country in the world. In 1807, the Portuguese royal family escaped from Napoleon and fled to Brazil. Although the king, Dom Joao VI, returned to Portugal in 1821, his son remained in Brazil and became emperor of the country. He declared Brazil's independence in 1822. In 1889, Deodoro Da Fonseca led a coup to take over the government from the emperor. He changed the government to a republic ruled by a constitution. Over the years since, the country has been ruled by elected presidents as well as by military coups. Lula da Silva was elected president in 2002. He was Brazil's first working-class president and was president for 2 terms until 2010. In 2011 Dilma Vana Rousseff became the first woman president of Brazil.